SnowFloss Kraut is the cousin brand to Frank’s Kraut. Both are made in the same way, at the same time, and have over one hundred years of authenticity behind the name. The SnowFloss brand was developed in 1905, when Midwest businessman Allen Slessman combined several regional sauerkraut manufacturers into what would become ‘one premier sauerkraut company’. Both SnowFloss and Frank’s are authentically made with three simple ingredients; cabbage, salt and water. It can take up to thirty days of fermentation to deliver one batch of SnowFloss, and the entire process is carefully monitored for quality and consistency by master Kraut makers who personally tend to each stage in the process. SnowFloss is literally one of the few hand crafted food products available, and has always been. SnowFloss Kraut is naturally gluten free and low in calories. It is available in three flavors: Classic, Bavarian (sweetened with sugar and caraway) and Polish Style (with caraway seeds). 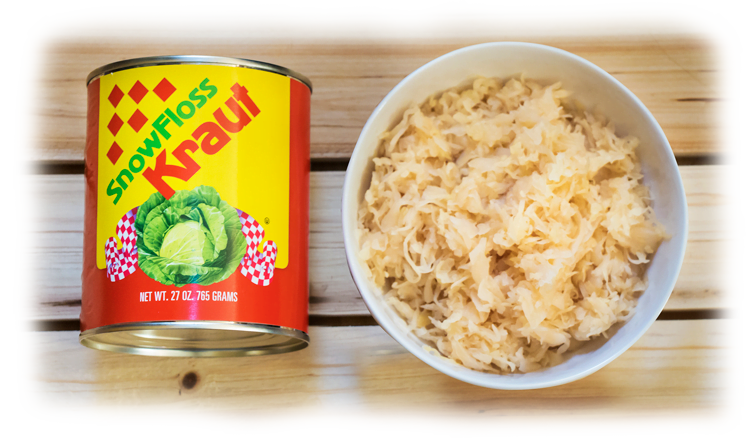 Connect with your own personal family heritage every time you make a meal with SnowFloss Kraut, and taste tradition.